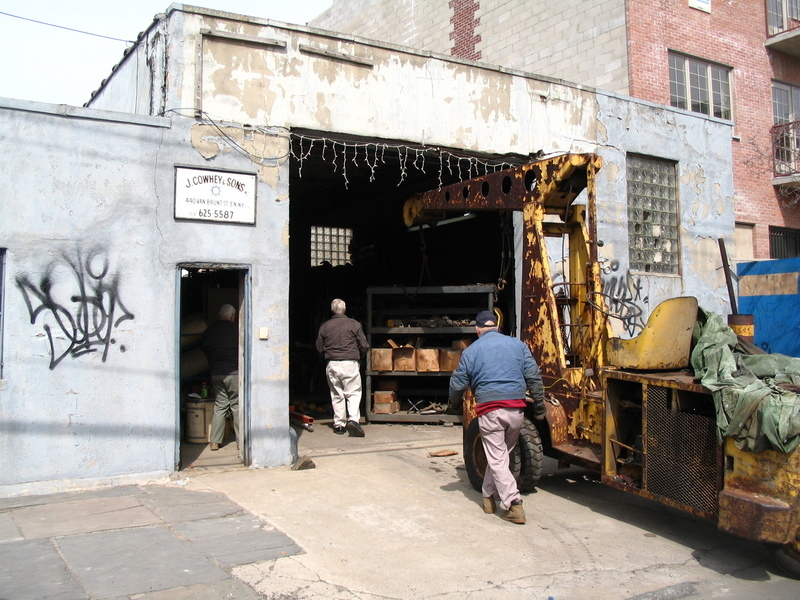 Cowhey Marine Hardware operated in Red Hook for about 150 years. The rump remains of the business was at 440 Van Brunt Street, the northwest corner of Van Brunt and Beard Street, and closed in 2005. 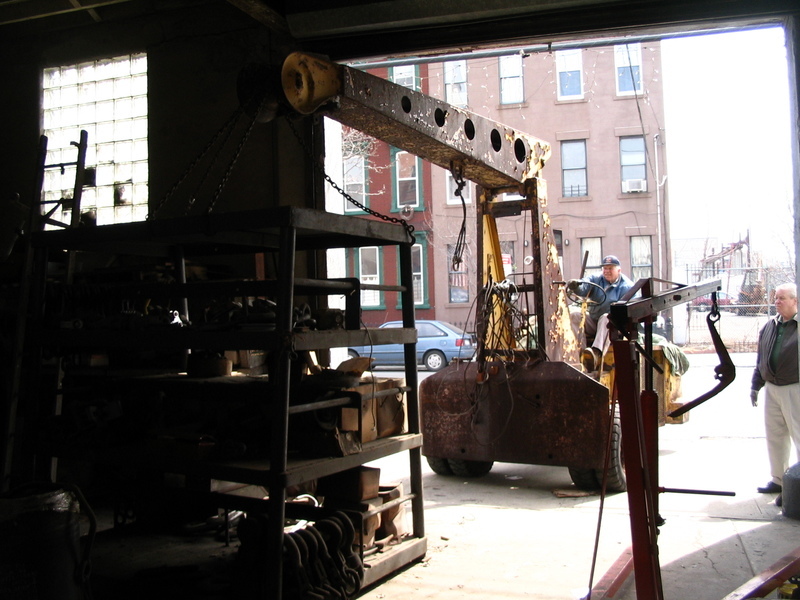 In 2013, PortSide successfully applied to have the Hyster determined eligible for the National Register of Historic Places, making it at the time the only vehicle in New York State to be granted that status. The history of this business and family represents the rising arc of an Irish family: how an immigrant family rises in stature, grows a marine business from “speculator” (someone who collected scrap metal by going boat to boat in the harbor - the maritime version of scrap collectors with shopping carts today), to a purveyor of nautical antiquities to the wealthy, then a marine hardware supplier and finally the operator of a port in Albany. The Cowhey family grew in prominence in Red Hook from their speculator days in the 1860s, and at the peak of the business, they owned most of a block in the vicinity of their final outpost at 440 Van Brunt Street. In 2005, as the business wound down, the Cowhey family operated a terminal in Albany of Federal Marine Terminals http://www.fmtcargo.com/. By the time his son Michael Cowhey was running the business, John Cowhey Sons, then located at at 400 Van Brunt, was a ship wrecking and salvage firm well known to decorators looking for nautical articles. Cowhey became famous in 1911 for purchasing the RELIANCE - a racing yacht than had won the prestigious America’s Cup - then dismantling her and selling her fittings and scrapping her parts. The 110-foot mast went to the Federal Baseball League park. 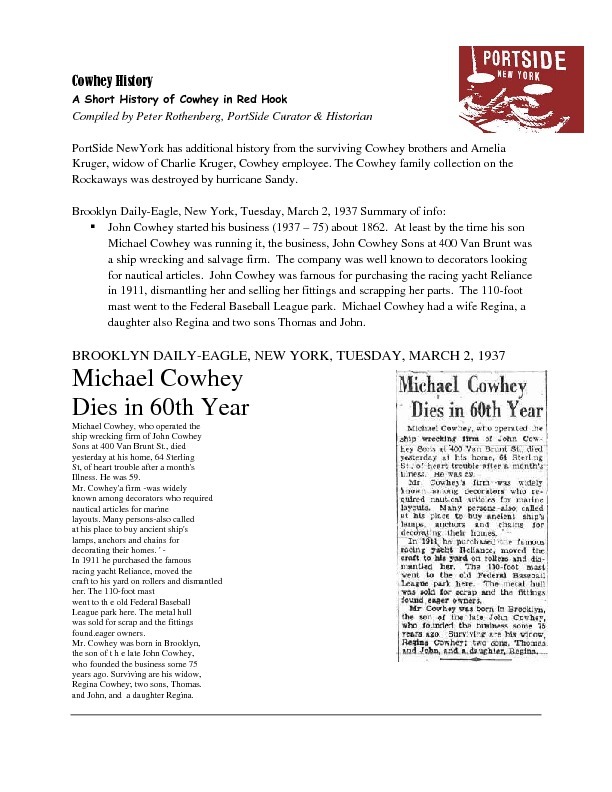 In 1931, the Brooklyn Daily Eagle, described John Cowhey as "one of the influential citizens of Red Hook" in his day. It also reported that Michael Cowhey had in his yard several large old church bells that he had bought for scrap but had decided to hold on to. The bells rang eerily in the night but: "if some one suggested that the ghost of an old Bailing ship skipper might be behind the tolling, he would nod solemnly. 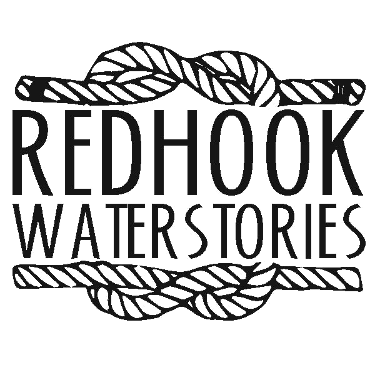 Then he would ask if his questioner had ever heard how in 1880 the wind blew so hard that Red Hook was white with scales, blown clean off the harbor fish, and how all the houses on the Hook had to be held in place by anchors. And how once it was so cold that he, Michael Cowhey, was able to walk barefooted over the ice to Staten Island." 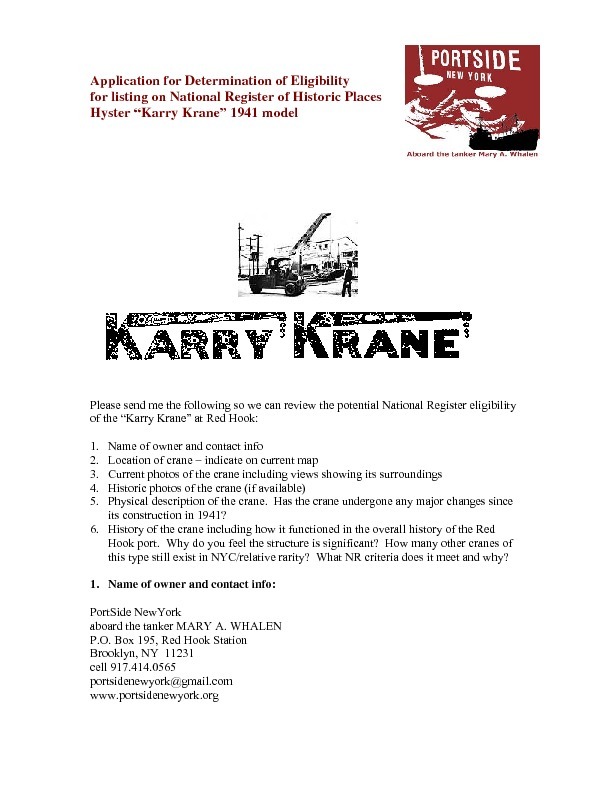 For more detail see the documents about the Hyster “Karry Krane” that PortSide submitted to NYS Office of Parks, Recreation and Historic Preservation linked below.